GeekBuddy keeps a local record of every chat session you have with a Comodo technician. 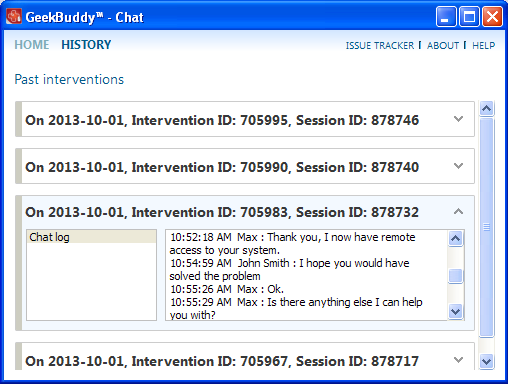 Clicking the ‘History’ link at the top of the interface will display all chat sessions that you had with our technician. This helps you keep track of previous computer issues and chats and can be useful as a reference when trying to fix future issues. Click the 'History' link at the top of the interface. All the sessions will be displayed. Click on the arrow button at the far end of the session history box that you want to view or double-click anywhere on the box. The chat session that you had with our technician will be displayed on the right side. 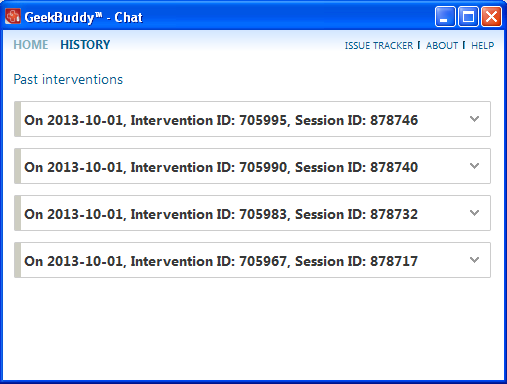 Similarly you can view the chat history of other sessions also.